Sola Granola. Sola. Granola. Granola from Sola. 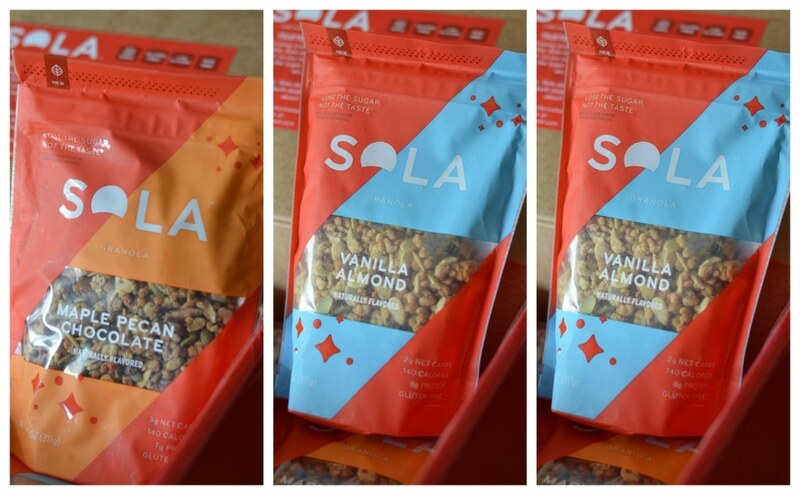 Granola made with Sola. Now I’m reviewing this separately from my review of the Sola yogurts because it deserves a standalone post. But that’s my absolute favorite thing to do with granola: put it on yogurt or cottage cheese. I like crunch. Something about crunch just does it for me. So anytime I do yogurt or cottage cheese, I always have to have some crunchy element like nuts, or Fiber One original, or something that makes it crunchy-munchy in my mouth. So let’s talk about this granola. Vanilla Almond: 140 calories, 11g fat, 9g carbs, 2g sugars, 2g sugars, 3g sugar alcohols, 9g protein. Maple Pecan: 140 calories, 11g fat, 9g carbs, 2g fiber, 3g sugars, 3g sugar alcohols, 7g protein. This granola looked a little bit different that other granolas I’ve seen. I’m used to seeing huge chunks of things, clinging together for dear life through the magic of liquid sugar. This granola, for the most part, wasn’t like that. The Maple Pecan most closely resembled granola I’m used to. The others had a looser configuration. In fact, check it out. Aside from that, the granola contains things like sunflower seeds, coconut, chocolate chips, and soy crisps. There’s this interesting dynamic with “healthy granola” that I was hoping wasn’t present in Sola granola. It tends to be chewy and not crunchy. While I like some things chewy, granola isn’t one of them! The inclusion of nuts (almonds, pecans) and the soy crisp keep it from being chewy, and I really appreciated that! When you put granola into yogurt (stay tuned for that review) it should be able to hold its own! And this granola definitely does. Vanilla-Almond: This was true to flavor, although vanilla and almond are not my favorite flavors. (I don’t hate them, I just wouldn’t naturally pick that flavor out of a line-up). It had a light sweetness to it and the aroma of vanilla was pleasant and true. Double Chocolate: I admit this wasn’t as chocolatey as I thought it was going to be. I think it’s triple chocolate because it has a chocolate coating and chocolate chips. The chips came through ok but overall I was underwhelmed a little by the chocolate factor. Maple Pecan Chocolate: Oh. My. GAH! I looooooooved this one. I think it’s the combo of the maple, the crunchiness of the pecans, the pepitas (pepitas!) and the chocolate. Yum, yum, and yum. My only wish (dear Sola) is to maybe give it a slightly salty finish. That would be a home RUN! But the maple flavor came across as authentic and the whole thing was just a joy to eat. My boyfriend stumbled upon me photographing the granola (Foodies, imagine how strange it is living at my house and finding your kitchen inaccessible for hours because someone is photographing granola) and he tasted all the flavors. He liked the Vanilla-Almond best and made me promise when I’m finished doing my review to give it to him! On Amazon, Sola granola is $10.99 a bag. Sit with it a moment. Just sit with it. Nature Valley Protein Oats ‘n Honey: This goes for different amounts in different places, but the cheapest one I saw on a simple Amazon search was $9.49 for an 11 oz. bag. I couldn’t tell (from their Amazon listing or their website) what the serving size is but if we assume it’s the same as Sola it has about 40 more calories, 32g of carbs, including 12g of sugar and 2 additional grams of protein. ProGranola from Julian Bakery: This goes for $13.99 on its website for a 19.5 oz. bag. There are 15 half-cup servings and each serving has no sugar (sweetened with monkfruit) and 12g of protein. With the ProGranola, the stats seem very good, but when you adjust it to the same serving size as the Sola, it’s pretty darn close to the Sola, protein-wise. And I personally don’t like monk fruit as a standalone sweetener (please don’t try to convince me to like it…I just don’t). In a blend, I can handle it but by itself is a big NEGATIVE! So…take that for what you will. In the realm of protein granola, you are going to invest some money in a product that truly has a good amount of protein (and a good carb:protein ratio). This is why it’s always important to read your labels! Would I buy Sola granola? YES! I like granola but the balance of nutrients is important. This has a good carb:protein ratio so that I know, with yogurt or cottage cheese, I’m not going to have a blood sugar drop later. Their product locator says it is sold near me but as of the time of this writing I haven’t been able to get out to the particular store where I can buy it. So I would buy a bag and use it judiciously. I don’t normally put 1/3 c. of granola in my yogurt. More like 2-3 tablespoons. So it’d last me. And at 10 years post-op I’m actually willing to invest more in my carbs to make sure they are working for me, not against me! Your mileage may vary. To learn more about Sola Granola, be sure to check out their website, and tell them Nik sent ya!